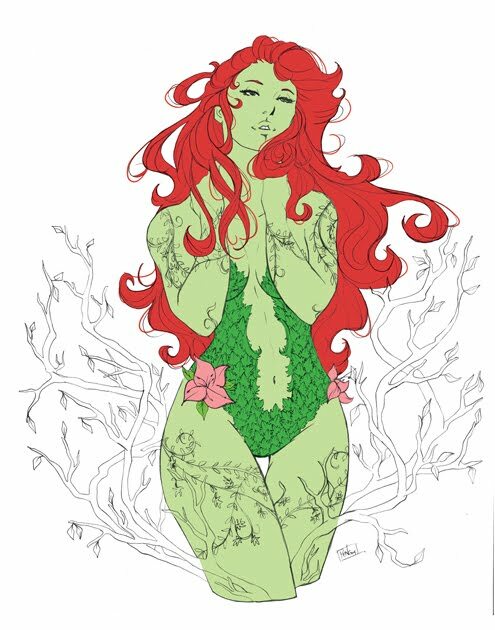 ...by the veronicas so i was having a hard time sleeping this evening because all i could think about is how i didn't get to work on the poison ivy piece like i wanted to today. but i think the biggest factor of me not wanting to sleep is because i had a frightening dream last night. now i'm not disturbed too much when it comes to nightmares, especially when it's been a whole day and i know it was only a dream. however, i dreamt that i fell into a mudhole and i sank and sank. and not even slowly. now i don't have to be a dream-reader to know that that can't be a good sign of what's going on in my head (and my life). i'm nearly certain that it has something to do with my day job and that makes me feel very unsettled. anyways, since i didn't get to work on the piece at all today, i decided to use this moment of insomnia to do something productive. so in the hour or so that has led me to 4am, i've gotten most of the flats done on her. all that's left are the intricate little vines on her and the twigs all around and i can finally start doing the fun stuff. if i can finish this up tomorrow night, i may still be able to squeeze this into the printing for Heroes Con! wish me luck!